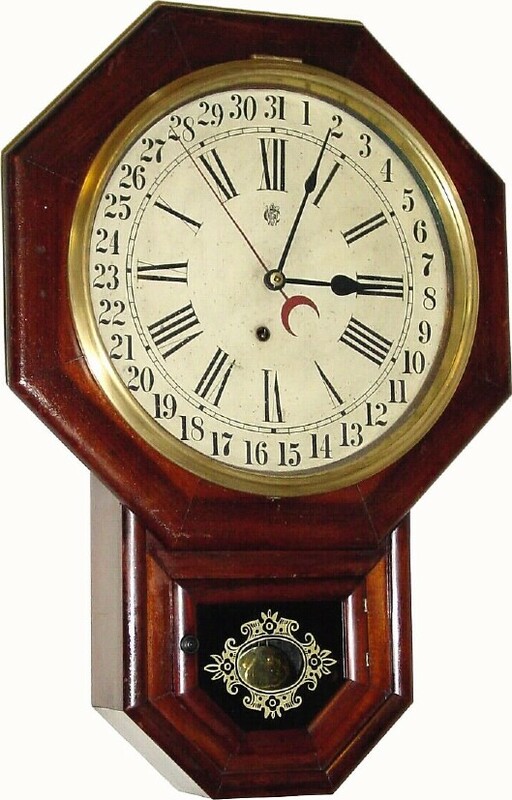 C.1895, Waterbury Clock Co., 8-day 12 Inch Drop Octagon Calendar , clock in good original condition. This rosewood veneered case is pretty nice with no damage. The painted dial has a few fly specs from going without a crystal for a while, but is in otherwise very nice condition (has replaced top glass). The original lower tablet has been reblacked from the rear. There is a very dark and partially readable label inside the case. Neatest part is unusual bezel hinge at 12 (never had a hinge at 3 or 9). Height 23"